Poignantly translated from the French by Claire Holden Rothman, David Bouchet’s Sun of a Distant Land is by turns charming and tragic, an epic contemporary vision of what it means to be uprooted, and what it takes to plant roots in a new land. David Bouchet (Daouda Toubab) is an editor, writer and screenwriter. He spent most of his life in Dakar, Senegal and has lived in Montreal since 2010. 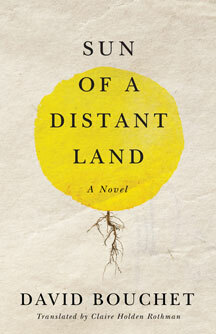 Sun of a Distant Landis his first novel. Claire Holden Rothman is a Montreal fiction writer and translator whose novels include My October(2014) and The Heart Specialist(2009). Her translation of Canada’s first novel, L’influence d’un livre (The Influence of a Book) by Philippe Aubert de Gaspé, won the John Glassco Translation Prize. 240 pp 7.5" x 5"